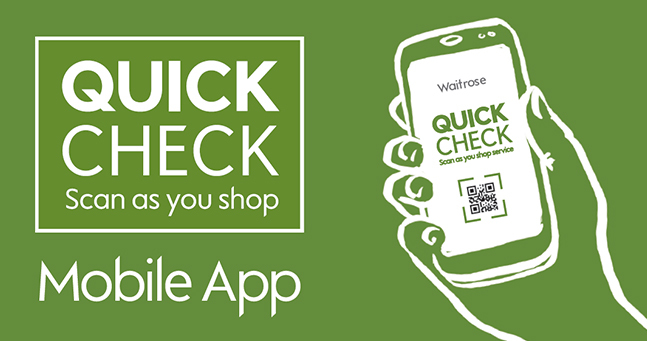 Visit Google Play or the App Store and search for 'Waitrose', then download the Quick Check app. Input your myWaitrose card number. You won’t need to scan your card every time you shop. When you visit Waitrose, connect to our free Wi-Fi to enjoy the best shopping experience. To start shopping, open the app and scan the 'Start your shop' QR code (shown above), located at the store entrance. Then you're ready to scan your items. 1. Scan the ‘Start your shop’QR code at the store entrance, then scan the barcode on each item. 2. Pack your shopping into your own bags as you go. There’s no need to unpack at the checkout. 3. Pay at any till. 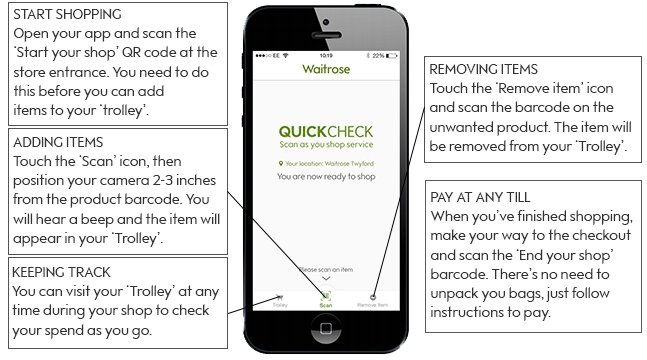 You don’t need to scan your myWaitrose card as your benefits will apply automatically. You need to scan every item before placing it into your bag, including products on promotion such as Buy One Get One Free (please note that some promotions will not register on your phone, but will be applied when you checkout). If you have any trouble scanning an item, keep it separate in your trolley and declare it to the Partner at the checkout before you pay. ‘Scan me’ barcode on the shelf edge. Quick Check was created to make your shopping quicker and easier. As part of the process, we’ll occasionally rescan your shop, just to make sure that you’re charged correctly. Our Partners will assist you with this process. Simply visit the Welcome Desk. We’ll happily show you how to use the Quick Check Mobile app.